FACULTY POSITIONS -- There are no positions available at this time. TIUA offers many job and volunteer opportunities for Willamette University students. As a student worker you can gain valuable office experience and work with experienced and professional staff. Other positions include being a Summer Community Associate or an International Peer Coach, working closely with American Studies Program (ASP) students in their every day experiences at TIUA and WU. Many of these positions are filled on a yearly or semester basis, so if no positions are open now, check back at a later date. Academic Tutors -- Check back later this fall for Spring Tutor application information. 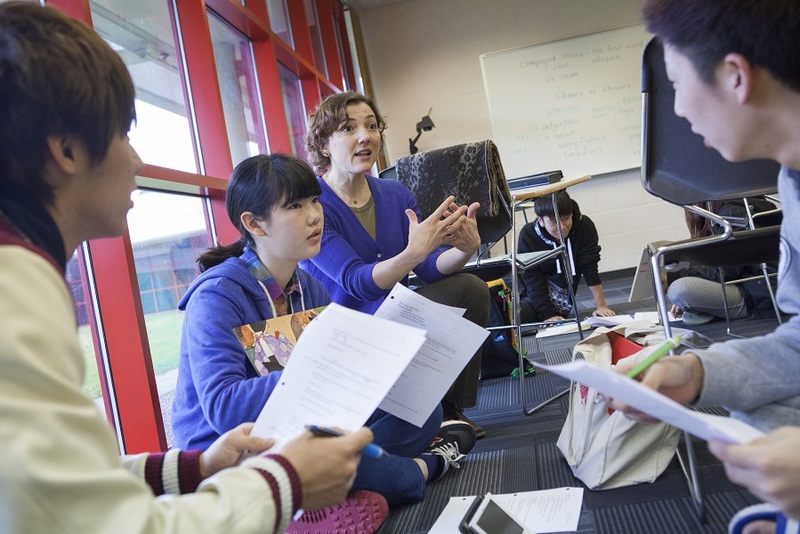 TIUA hires Willamette University students as peer academic tutors for American Studies Program (ASP) students in spring, summer and fall semesters. The peer tutors work closely with faculty members to provide a positive and supportive learning environment for students. The peer tutors meet regularly with students outside of class, often in a one-to-one tutoring situation, to help students understand class content and develop better academic English s kills. New tutors are generally recruited during spring semester. At that time, there are information sessions held by current tutors, announcements on Job Cat, and tables in Goudy to announce the opportunities available. Applications will be posted here when openings become available. 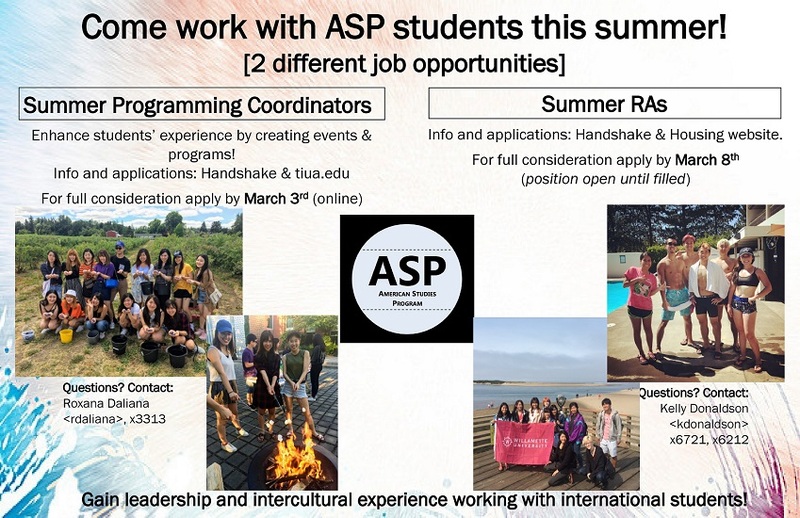 Summer Programming Coordinators (coordinators) are a team of current or graduating Willamette University students responsible for creating co-curricular opportunities for *American Studies Program (ASP) students during their summer semester and summer vacation period. Coordinators are expected to support an environment conducive to academic success and personal wellbeing of all of the residents in the ASP summer community. Work closely with professional TIUA office staff. Duties include general secretarial work, event planning/organizing, cultural programming, video filming/editing, tabulating cultural survey results, and working with ASP students in all aspects of their experience at TIUA/WU. 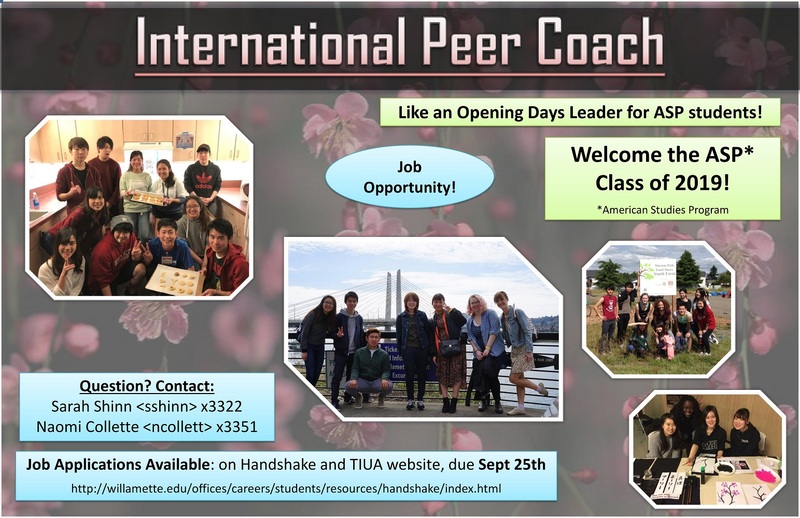 2019 International Peer Coach (IPC) - check back in Fall 2019! Play an important role in the integration of ASP students into the WU and Salem communities! As an IPC, you serve as an orientation leader for the new ASP students. You will plan trips and events, organize weekly group meetings and info sessions, help students understand university policies and American customs, and serve as a mentor during their first few weeks at Willamette University.